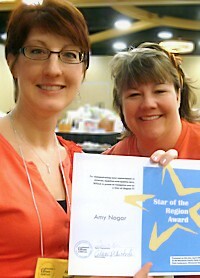 Hi, my name is Amy Nogar and I'm the family child care provider behind Amy & Kids Co. Family Child Care. I didn't plan to become a family child care provider, but after almost 20 years in family child care I can't imagine a more fulfilling career! This is the story of how I accidentally fell in love with family child care; after reading it be sure to check out my professional credentials, then take a moment to see what other special qualities it takes to be a family child care provider and early childhood teacher. My husband and I were in college when our son was born. We needed someone to watch him while we were in class so I searched for child care. I was young, naive and didn't know what questions to ask or what to look for when choosing a family child care provider. What I found was a series of moms who were looking to supplement their income for a little while, but never intended to have a career in child care. Several quit unexpectedly and left me scrambling to find a new provider, while our son was devastated because he had formed attachments to his caregivers. Looking back I realize that these frequent changes weren't good for him, but I didn't know that then. After college my husband attended graduate school in St. Louis and I got a job teaching music. The graduate school had a regulated child care system with students' wives caring for other students' children. Our son's first regulated caregiver was a wonderful woman who had been a teacher and did many projects with the children. Our son loved playing at her house and I felt very at ease leaving him there. Her husband graduated in the spring so we only had her for one school year, but I still remember the sense of security I felt knowing that my child was being well cared for when I was at work. We began our second school year in St. Louis with a brand new daughter, born Labor Day weekend. I was able to spend six glorious weeks with her before my maternity leave ran out and I had to go back to work. I wasn't happy about it but we needed the income and benefits from my job. Another student's wife had agreed to care for both our newborn daughter and our three year old son. She seemed very nice, but one day when I picked up the children I was told that our eight week old daughter had cried until her face was purple. "She cries unless I'm holding her or she's in the swing" the woman said. My immediate reaction was "Then why aren't you holding her?" Shortly afterwards we found a new family child care provider who was the mother of five and easily incorporated our children into her family. The following spring we moved to New York for my husband's internship. Since we only had one car I wasn't able to get a job so I stayed home with our children. It was a wonderful year! 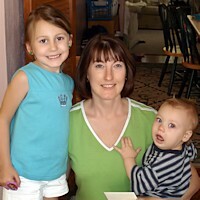 I loved taking care of our home, baking, crafting, and most of all I loved being with our children. We decided that if it were at all possible we'd find a way for me to stay home while our children were little, but we also knew that I needed to contribute to our family income. That's when we decided I should care for other students' children when we returned to graduate school. 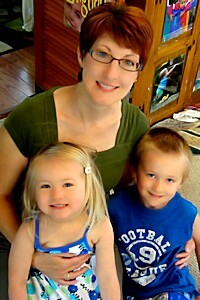 I began doing family child care thinking that I would only watch children until my husband finished graduate school. I opened my family child care doors in the fall of 1993, with little more than my experience as a mom, a borrowed portable crib, and a couple of books lent from the graduate school nurse to start out with. I loved being home with our children and I loved knowing I was helping out other families, but I still planned on getting a "real" job eventually. My husband decided to stay a 5th year in graduate school and during that second year another daughter was born to our family. Along with our changing family my attitude began to change; I enjoyed family child care so much that I decided to continue as a family child care provider, and my "in-between" job ended up turning into a career. After a brief break from family child care while we lived out East, we moved to my husband's hometown in Michigan. I quickly became a licensed family child care provider and joined the Federal Child and Adult Care Food Program (CACFP) for the first time. My husband and I had decided that I would continue as a family child care provider indefinitely so I focused on making my child care business more professional and improving my knowledge and expertise so I could provide higher quality care. I attended my first child care conference and soaked up the information like a sponge. This small taste of the Early Education field reinforced my desire to be a professional family child care provider - not just someone who "watched" children. Our fourth child, a son, was born about the time we decided to move to my hometown in Wisconsin so we could be closer to my family. There was no doubt that I would continue providing family child care; one of the biggest criteria while house hunting was whether the house would work for family child care. We found a home we loved, made the changes necessary for it to support child care, and in October 1999 Amy & Kids Co. Family Child Care opened its doors. I renewed my membership in CACFP and joined the local child care association, Valley Association for the Education of Young Children (Valley AEYC). I also joined several other professional child care organizations: Wisconsin Early Childhood Association (WECA), National Association for the Education of Young Children (NAEYC), and Wisconsin Family Child Care Association (WFCCA). I used my membership in the professional organizations to earn continuing education hours; first attending local, then state conferences, and eventually traveling to Chicago for the national NAEYC conference. Around the same time I became aware of a new accelerated education program for child care providers offered by Fox Valley Technical College. The program consisted of one four-hour night of class each week plus one eight-hour Saturday each month with the majority of the work being done out of class. After two years of late nights and hard work I proudly graduated in May 2003 with an Associate degree in Early Childhood Education! Over the years I've been a family child care provider in Wisconsin I've become more active in the early childhood professional organizations. I've served as secretary of Valley AEYC from 2001 to 2004 and in 2009 to 2012. I designed and maintain Valley AEYC's website, have been co-chair for our annual Mini-Conference since 2001 and took over as conference chair in 2012. I have presented workshops at Valley AEYC, WFCCA and WECA conferences, and continuing education workshops at Fox Valley Technical College and Valley AEYC meetings. 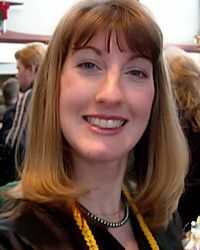 In July 2013 I was asked to join the faculty at Fox Valley Technical College as an Adjunct Instructor in the Department of Early Childhood Education, teaching the first two courses required for the Family Child Care Credential. I enjoy the challenge of researching and writing workshops to present, as well as the opportunity to share my knowledge and experience with other child care professionals. All along I've continued to improve my program and in 2011 my efforts were noticed and rewarded; I was presented with the first WFCCA Star of the Region Award. This award is presented each year to just one family child care provider in each region for "demonstrating a commitment to children, families, and quality care." In addition I was selected to serve on the Conference Planning Committee for the 2011 WECA Conference. As the only family child care provider on the committee I represented family child care providers throughout the state of Wisconsin. I was both humbled and honored to be selected for both the committee and the award, but at the end of the day it's the sparkling eyes, bright smiles and sweet hugs of “my” children that make my day and cause me to look forward to the next one. Although family child care plays a big role in my life, I enjoy other activities too. I love spending time with my family, puttering in my garden, maintaining my websites, and sewing. I also enjoy directing an adult handbell choir and a middle school band in weekly rehearsals. If there's extra time you'll find me curled up with a book or taking a walk with my husband. My family members' involvement in the program provides the opportunity for your child to experience the joys of being part of a large extended family. 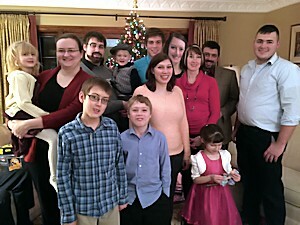 Take a moment to meet my family members - they are an important part of Amy & Kids Co. too!